AccuWeather-(ENEWSPF)- AccuWeather reports July-like heat baked the central and eastern portions of the United States early this week, putting century old records temperatures in jeopardy. The heat expanded from the High Plains to the East Coast from Sunday toWednesday. “A strong area of high pressure combined with warm southwesterly winds have combined to bring record-high temperatures to much of the central and eastern U.S.,” according to AccuWeather Meteorologist Ryan Adamson. In most cases, highs have generally been around 10 to 20 degrees Fahrenheit above average. In some cases, highs have reached 30 degrees above average. Dozens of record-high maximum and minimum temperatures have been recorded during the warm spell. Some records broken or tied have stood for over a century. 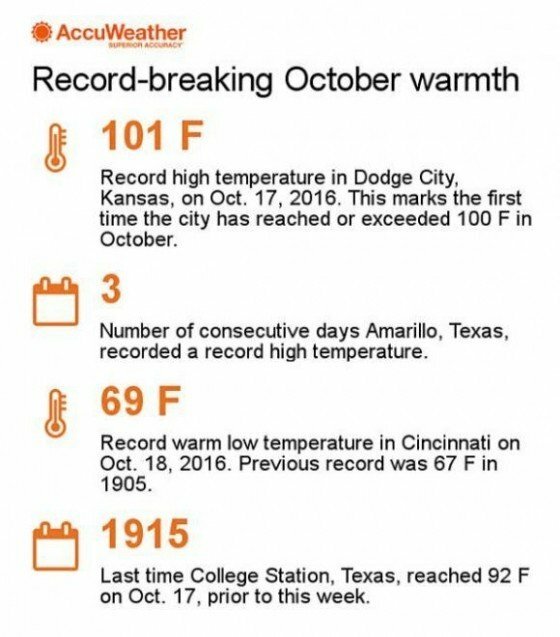 On Monday, Dodge City, Kansas, reached 101 F, which smashed the previous record of 94 set in 1926. This is the first time the city has recorded a temperature at or above 100 during the month of October. The heat then expanded eastward on Tuesday. Baltimore; Hartford, Connecticut; Newark, New Jersey; Evansville, Indiana; Nashville, Tennessee; New Orleans; and Huntsville, Alabama, are only a handful of cities that broke records on Tuesday. Philadelphia and New York City came up 1 degree shy of breaking records that date back to 1908 and 1928, respectively. More records may fall across the East on Wednesday, before conditions will cool down into the weekend. The ongoing drought across the Northeast and interior Southeast has been an extra factor in amplifying the heat. With the ground being so dry, the sun’s energy can go directly into heating the ground as opposed to drying moisture from the ground, Adamson stated. Maybe even more impressive than the warmth during the day have been the mild nights. “Many places have seen low temperatures at or above the normal-high temperatures for the middle of October,” Adamson explained. “With how warm the nights have been, the temperature has not had to rise very far to reach record or near-record levels during the day,” he added. The warmth may dull some of the fall colors across the region. “Mild days and cool nights are usually ideal when it comes to the best foliage colors,” according to AccuWeather Meteorologist Jordan Root. While the summerlike weather may be unwelcome to those who enjoy crisp fall days and chilly nights, the sunny, warm conditions have provided an excellent opportunity to go hiking, leaf-peeping and pumpkin-picking. According to the Smoky Mountains fall foliage prediction map, leaf color is peaking along the I-95 corridor from Boston to New York City and Philadelphia, while interior portions of the Northeast are past peak color. AccuWeather meteorologists predicted a warm fall in the East earlier this year, and this trend is expected to continue into November. “Overall, temperatures look to remain above normal despite periodic cooler days,” AccuWeather Long-Range Meteorologist Ed Vallee said.